The identity and ancestry of King Fergus Mor is one that has puzzled genealogists and historians for centuries. He is called Fergus mac Earca and Fergus mac Erc. Traditional Irish genealogies state that his mother was Earca, others that his mother was Nissi. He is also said to have married a Princess Earca. Some state that his father was Muredach High King of Ireland who was a grandson of King Niall of the Nine Hostages through his son Eoghan others that his father was Erc a son of King Loarne or that his father Erc was the son of King Eochaidh Muinremuir of Dal Riata and many other scenarios. Even more confusing is the dating of King Niall Mor of the Nine Hostages- historians now believing he is dated too early by the traditional Irish accounts. I believe that a study of the Pictish Princesses Royal clears this up. The first historically verified King of Picts was King Drust who was the son of Erb or Erb or Erc. At this time the king of Gwent was King Erb the son of King Erbin a son-in-law of King Eudaf Hen (Mar Judah Hen). So either the son or the father could be the one in the Pict King List. This Gewisse (Jewish) dynasty came from the Davidic Royal House. The name Erb and Erbin being versions of Heber and Eber. The name of Earca being a Gaelic version of Esther. King Drust of Picts's sister was the Pictish Princess Royal. The King of the Picts must descend from a mother of the Royal line. The second historical King of the Picts is King Talorc the son of Aniel. This name Aniel refers to Niall or one of his O'Niell descendants. Thus King Drust's sister Nissiya Esther (Nissi Earca/ Princess Esther)is the mother of King Talorc. The title Nissiya is the feminine of Nasi (Prince of the Davidic House) thus meaning Davidic Princess. There is added confusion due to fathers-in -law being listed as fathers and female parents sometimes being thought to be male by future generations. King Talorc's sister Nissiya Cenue married King Erbin of Strathcylde who is called Erp in the Pictish king lists. King Erbin's son was King Nectan (or Nathan)of Picts. King Erbin of Strathclyde was the son of Neithon (or Nathan Todros) the Judiarch of the Gewisse (Gwent) - he is also called Theodosius the Younger (Tewdfalch) as his ancestor was known as Theodosius the Elder (Mar Chuna). He is listed by some as the son of Ceretic King of Strathclyde and the Gewisse but Ceretic is his uncle-in-law. Ceretic was the son of Cunedda (Chuna the Good) who was the British Roman Emperor Constantine III. King Neithon of the Gewisse was the son of King Ninnian (Nunius/Nehunia)of Gwent who was a brother of King Erb of Gwent mentioned above. 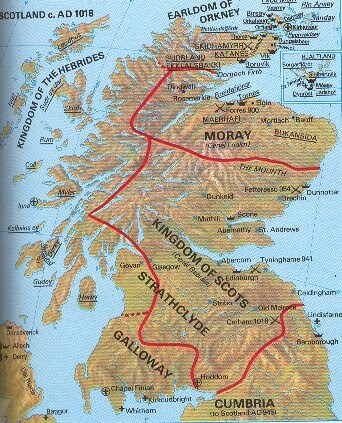 King Ninian and King Erb are the sons of Erbin (Eber Scot) the Jewish Scottish Exilarch from Golodinn. Erbin's brother was Chuna and they were the sons of St. Ninian of Scotland. Ninians father was Mar Chasdai who was also known as Golomh or Galamh and he left Babylon for Spain where he was a soldier. He afterwards came to Britain and married Scota the daughter of Raphael the Scottish Exilarch (Rosh Galuta Scotti) of Goloddin. Mar Chasdai was the son of the Babylonian Exilarch Nathan II. The legends of Scota has been combined from the lives of a number of Princesses bearing the name Scota or Bat Scotia. The original Scota was Princess Sukkota who with her sister Tamar Tia were the daughters of King Zedekiah of Judah and his Egyptian-Jewish wife Queen Tzadikah (Tzaddah) the daughter of Pharoah. The tales of this Sukkota and the Milesians became mixed with those of her descendant Bat Scotia who was the daughter of Phares who was the first Scottish Exilarch. And then these were confused with the tales of Scota who married Galamh of Spain (who was also called Milad or Milesius because he was a soldier). The name of Niall and Nel are also found in some of these stories of Scota. Thus the son of King Niall who married the Nissiya Earca of the Scotti was Conall o'Neil also surnamed Cemthainne and Gulban. His son Fergus Cerall went to Scotland and ruled Dal Riata and was remembered as the great Fergus mor Mac Earca. His wife Earca had also married his cousin Muredach the O'Neill High King. Fergus was the grandfather of St Columba. The name Earca as Esther entered the Royal family when Nissiya Esther (the daughter of the Babylonian Exilarch Nathan I Ukba) married the Scottish Exilarch Raphael IV (b.220). She was the sister of Nathan Mar Ukba II and Rabbanu Nehemiah. Rabbanu Nehemiah should not be confused with the Exilarch Nehemiah who was Rabbanu's nephew the son of his sister Esther. Exilarch Nehemiah (Neman)was firstly the Scottish Exilarch who went to Babylon to become the Babylonian Exilarch. He left his uncle Nathaniel IV as the Exilarch of Scots in Goloddin (Gododdin) and he also left his oldest son who became Rafael V Loir Rosh Galuta Scoti in Scotland. Rafael X was married to Princess Seng of Argyle and his daughter Esther or Earca married Eudaf Hen. 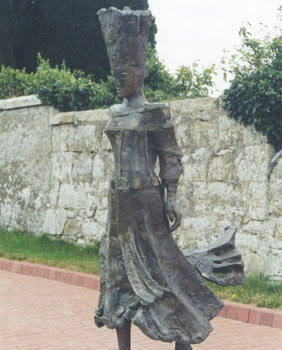 This Earca 's daughter Nissiya Ceneu was the mother of Earca who was the mother of King Fergus Mor. The Mor often found in these genealogies alludes to the Jewish title Mar for those of the Exilarch family. Here we see the origin of the Jewish matrilineal practices found amongst the Royalty of the Picts. Fergus is said to be the father of Domangart and he in turn is described as the father of Gabhran of Scots. However some historians doubt his existence or his reign. However Domangart did exist but he was not the King of Dal Riata and he is not the son but the son-in-law of Fergus. He is Dumnagual King of Stathclyde and his wife is Fedlim the Fair the daughter of Fergus and his wife Earca. Dumnagual's brother is Cinuit who married Corun the daughter of Ceretic. Dumnagual and Cinuit are the sons of King Erb of Gwent's brother Nathan the Judiarch of the Gewisse and King of Picts. Dumnagual and Fedlim's daughter is Igenach the mother of Queen Luan wife of King Gabhran of Dal Riata. Thus Fergus is the grandfather of Gabhran's Queen. Gabhran's father is Chunan Meriadoc (Mar Chuna) King of Brittany. Chanan Meriadoc is the son of Theodoric (Todros b. Nathan/ Tewdrig)the Judiarch of the Gewisse. Theodoric is the grandson of Nathan (Theodosius/Tewdfalch)Judiarch of the Gewisse and King of Picts. Note: Lebor Ghabala and Geoffrey Keating are too important sources in reconstructing the genealogy of the Scottish Exilarch family.